Home » News » Read the April 2019 Houston Bar Bulletin! The Houston Bar Association has launched its monthly online Houston Bar Bulletin to serve members with timely, interactive communication about events and activities, CLE, sections, networking, professional development, volunteer opportunities, and other member benefits. You will receive an email each month giving you a direct link to the newsletter. 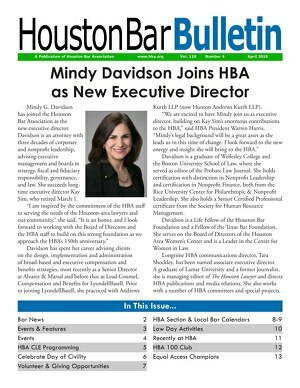 The Houston Bar Bulletin also will be posted on the homepage of the HBA website, and you can read the newsletter on your desktop or mobile devices. Click below to read the April 2019 issue. You will be able to print the Houston Bar Bulletin on your office or home printer, if you prefer a paper copy. Members will still receive the e-Bulletin every Monday; the CLE Update every Wednesday; the bimonthly print magazine, The Houston Lawyer; and special emails highlighting upcoming events or important information. The monthly online Houston Bar Bulletin will join that lineup to give you more in-depth information on HBA activities for the coming month, as well as photos and recaps of events. If you have questions about the Houston Bar Bulletin, please contact Communications Director Tara Shockley, taras@hba.org, or Web Manager Carly Wood, carlyw@hba.org or call (713) 759-1133. The deadline to submit information for next month’s Bulletin is Monday, April 15.